Austin Melcher, a 2009 member of Pioneer submitted this photo and caption. Aging out is a difficult time for anyone who has marched in a drum corps. Having good friends along for the ride is what made my last summer memorable and wonderful. This photo is the culmination of that ride with my bus seat partner and good friend Olivia. Being on the field during the age-out ceremony after the '09 World Championship Semifinals at Lucas Oil Stadium was an experience like no other. 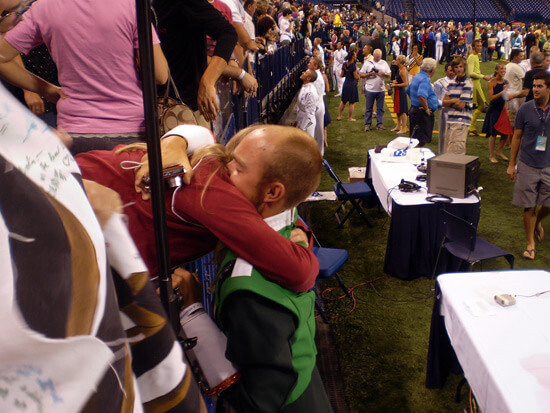 Getting a hug and sharing that night with someone who was there with me through my last days in a drum corps was even more special. I will never forget that night. Thank you Olivia.